8 ft. Fitted Table cover with open, closed, or zipper back. 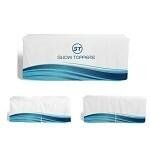 6 ft. Fitted Stretch Table Cover with open, zipper or closed back. 8 to 9 days after proof approval for quantities below 20 pieces. Rush service may be available.